In one swoop, nearly every counselor in Spokane Public Schools was laid off — at least temporarily. 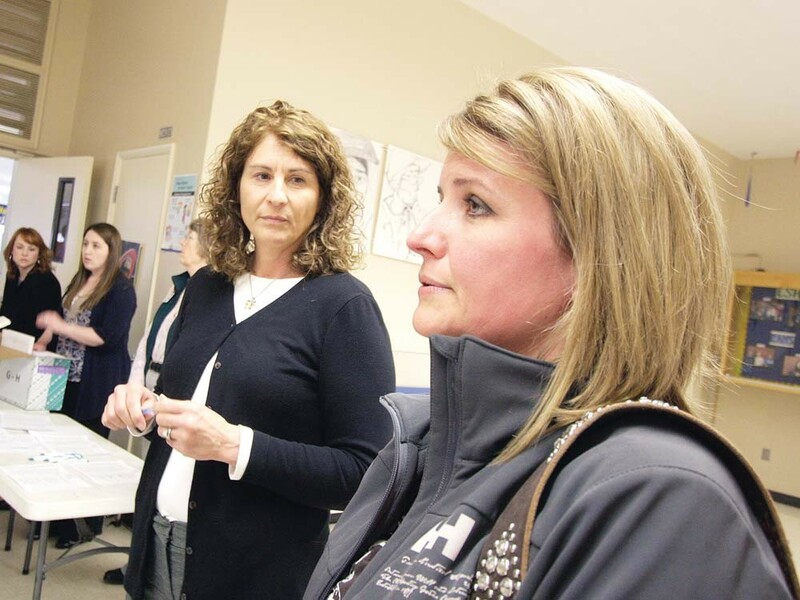 Jefferson Elementary School teacher Gail Madsen, right, talks about layoffs, with Human Resources Specialist Diana Shelton. Nikki Easterling referred 29 Regal Elementary students to Child Protective Services over the last year as the school’s counselor. In the last 30 days alone, she has intervened in 24 incidents in which students became so out-ofcontrol they had to be removed from class. Last Friday, she was laid off. Along with a slew of teachers, librarians and psychologists, 55 school counselors in Spokane Public Schools — elementary, middle and high school — were eliminated. “It will seriously impact these kids,” Easterling says. It’s possible that some of the counselors will be hired back before school starts this fall. That’s what happened to most of the teachers that were laid off in 2009. Some of those same teachers are on the layoff list again. In the cafeteria at Glover Middle School, Easterling and dozens of other counselors hold their layoff letters and crowd around their union rep with questions. One has 22 years of experience as a counselor in the district. Another has 30. Only 17 counselors, those with qualifications to teach, were spared. Normally, layoffs are done according to seniority. But that doesn’t hold true if an entire program is eliminated. Now that Spokane Public Schools finds itself in an unprecedented budget crunch, that’s a possibility. The school board has to wait for the state Legislature — still in special session — to announce a statewide budget. For now, the board is assuming an estimated $12 million deficit. Cutting $12 million isn’t easy, especially on top of $54 million worth of cuts in previous years. Across the state, schools are making brutal choices. The East Valley School District will shut down Mountain View Middle School next school year. Legally, any layoffs of certified staff, like teachers or counselors, had to be made by May 15. That’s why the board sent out 238 layoff notices, without knowing which cuts will be made permanent. In 2009, stimulus money from the federal government allowed most teachers to be rehired. But there’s no stimulus this year. “We’ve always said publicly: The year we don’t get that stimulus money, we’re going to have a big problem,” says school board member Bob Douthitt. For now, the people who got laid off are waiting — first for the legislature to decide how deep the cuts will be, and then for the school board to decide who survives. Even if the board increases class sizes to the maximum, the budget gap will only be bridged halfway. The board will have to calculate the possible impact of losing some or all counselors. The counselor’s job description is broad. They find resources for students in poverty, extra help for students who have fallen behind in their schoolwork. Easterling meets with classes from kindergarten to sixth grade and talks to them about bullying and harassment. Poorer schools would be disproportionately impacted, Easterling argues. At Regal, 87 percent of students qualify for free or reduced lunch. Parents with insurance can afford to seek private counseling. But the kids who really need counseling may not have it available to them at all. But Theis, like many counselors, doubts that counseling will be eliminated entirely. “I’m cautiously optimistic that reason will prevail,” he says. “I still think it’s some sort of a semi-bluff.” Pose the possibility of eliminating counseling entirely, in other words, and suddenly raising class sizes by three students doesn’t sound so bad. But the fact remains that $12 million has to be found somewhere. Thies, for his part, has suggestions, such as cutting back on travel. “We just sent someone from our building to Las Vegas for three or four days to learn about new grading models,” Thies says. The school district, he adds, has over 100 “academic coaches,” only few of whom are paid for through a narrowly defined academic grant. These experienced teachers don’t have a classroom themselves. Instead, they teach teachers how to teach better. Eliminating them, Thies estimates, could save around $5 million.